The Nigeria Football Association has indefinitely suspended Mikel Jon Obi from all national teams. The Chelsea midfielder opted out of the Nations Cup qualifier against Uganda three weeks ago citing injury. And Chelsea sent a letter on behalf of the player confirming he was undergoing treatment in London. But NFA spokesman Ademola Olajire said: "Mikel's gross act of indiscipline and lack of commitment towards national call-ups is totally unacceptable." Olajire added: "Since Mikel prefers his club over his country, we can only wish him the best of luck. 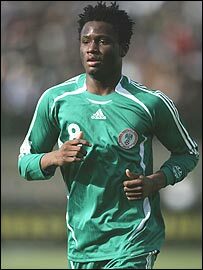 As well as missing games for the senior side Mikel, 20, has also not responded to recent calls to play for the country's under-23 side. Have Your Say: Loyalty to club or country? "The fact that both coaches do not need him in their squads means his continuous invitation to the national teams is of no relevance," said Olajire. A country v club row erupted after Chelsea failed to release the midfielder for independent assessment of the hamstring injury by Nigeria's doctors as mandated by Fifa. Mikel's failure to turn up in Uganda for that assessment led to him being axed by coach Berti Vogts from the Nations Cup squad that defeated Niger 3-1 last weekend. "The national coach said before the game against Niger that Mikel did not show any sign of commitment that he wanted to play so he left him out," Olajire said. "The national under-23 coach Samson Siasia also says he does not need Mikel in his squad since he preferred to play for Chelsea rather than Nigeria. "Siasia is embarrassed that Mikel who played under him - at the Fifa World Youth Championship two years ago - is being disrespectful and disinterested in playing for his country."